Having already given you my Campsite to Cockpit backstory I have now completed the Le Mans test weekend. For our team, last weekend was not just another test, it was also the first time that most of us had met each other, let alone driven the car. Many teams come to Le Mans halfway through an ELMS or WEC campaign and they already know the car and each other very well. None of us had ever driven the car before and we had never worked together before. In addition both myself and San needed to complete our mandatory ten laps, and familiarise ourselves with the car and all its systems and controls. As a reserve driver for Murphy Prototypes last year I had already driven the circuit before but San had never been here before so needed to learn the track too. With all this in mind I arrived on Friday afternoon to prepare for the Sunday test. To an outsider you cannot believe that you would need to arrive two days early for a test day but the reality is that there was not a spare moment over the three days. On arrival the first job was to head straight to the garage and meet the team. These are the guys that will be working relentlessly over the next two weeks to give us the best chance possible in the race. They are also the guys who you put your trust in to keep the car reliable and safe. This commands respect and I always make a point of introducing myself to every team member and remembering everyone’s names. It is difficult when you meet about twenty five people all at once to take in and remember everyone so I make a note on my phone of every name and then if I forget any I have it there. This system works and is crucial to building the respect and a relationship with the guys. AAI Motorsport have a technical partnership with the highly experienced Prospeed squad so the majority of the team are Belgian but we also have drivers from four different countries, an Italian engineer and a Japanese team manager. It is a truly international affair. It became clear that language and clear communication are going to be important factors. I also met San for the first time on Friday and was relieved to find out what a dude he is. He is a really nice guy, huge enthusiast of the sport, and a proper character. I could tell we were going to have some fun over the next few weeks. Then there was some serious prep to get done. I was allowed to utilise some spare space on the car to give a few of my personal sponsors a bit of extra branding. 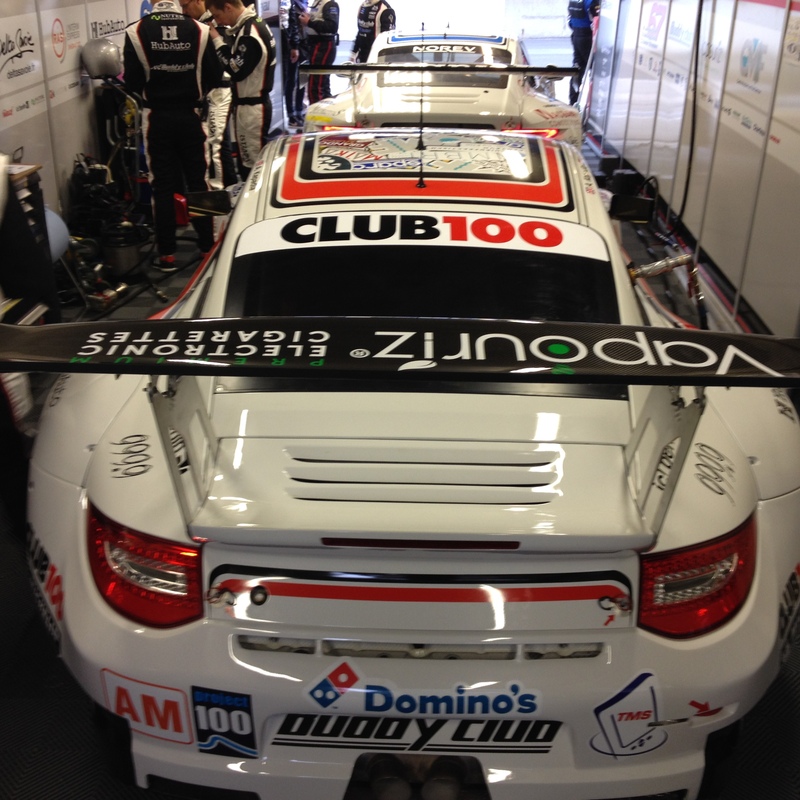 Vapouriz and Club100 were very happy to get a few good spots on the rear of the car. This is likely to be seen a lot on the onboard cameras as the LMP1 cars lap us. The team wanted to install a new radio kit and drink system to my helmet, I needed to check I was comfy in the car and more than anything I needed to understand all the controls and systems for the car. A few days before the test I had been sent a thirty six page document by the team explaining everything, now I needed to see how much I could remember! Much of it was standard stuff like the locations of switches and controls but you also need to understand and remember the different engine maps positions, TC options, and also important, how to put the car in reverse. You think you would hardly ever need to use reverse but it is important in case anything happens in the race and the ACO officials also do random tests during the test day to check you can put the car in reverse without outside assistance. Once that was all memorised we headed back to our accommodation from Project100 in a lovely house in the woods between Mulsanne and Indianapolis. The next day involved signing on, taking all our kit to scrutineering, a team briefing with the engineers where a run plan was decided on, drivers briefing and a track walk. At nearly 14km long you do not walk the whole track. We headed out by car to see the public road section which is everything from Tetre Rouge round to the entry to the Porsche curves and then did the rest on foot. I always pay particular attention to the condition of the sections linking the Bugatti circuit to the public road as these are only used twice a year and build up a film of dust and dirt. Interestingly the new tarmac on the outside of the Porsche curves was pristine but the construction traffic that had been present to lay the tarmac had spread mud all over the circuit itself. I noticed it was a brown colour in comparison to the dark black of the new run off. This meant it was likely to be really slippery and take a while to clean up. Sunday came round quickly and I was first out in the car to get my ten laps. They went by very quickly and I was relieved to have got it out of the way and off my mind. My first impressions of the car we that it had more oversteer than I was expecting and we started to work to dial that out as the day went on. We also had a few minor issues with the traction control but got this sorted quickly too. Until this point conditions had been dry but as San headed out for his ten laps the clouds came over and it started to spit with rain. A few laps into his stint San had lost tyre temperature and had a small off into the gravel at turn 1. No damage done and he was back on the way within a few minutes. He got his ten laps done and Xavier managed to jump in for a few laps before lunch on wets. 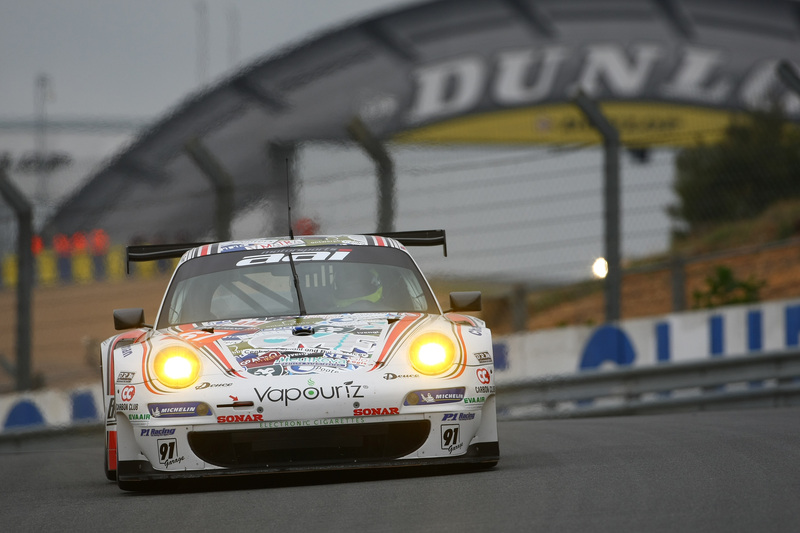 So my first session was over and I had had my first experience of a GT car at Le Mans. I felt that compared to my ten laps in the Murphy LMP2 the GT was a far harder car to drive, as we were not flattered by anything like as much downforce and also you are constantly being dive-bombed by LMP1 and LMP2 cars travelling up to 45 seconds per lap faster. I am used to multi-class racing in Radicals but I am usually the one doing the passing. I now had a much greater appreciation for how hard the GT drivers work to not only get the cars round the circuit but also how you needed to have one eye on your mirrors all the time and how the skill is to lose the least amount of time being passed. When an LMP1 is behind you the headlights just fill the mirrors even when they are still 100 metres back and you cannot see how far behind they are. If that is what it is like in daylight it is only going to be worse at night. After lunch Xavier and I did some more runs, focusing on a good safe set up to make San feel as comfortable as possible. He still needs more time in the car and we know that our race result will depend on how confident he is with the car. I was happy to see that in the wet I was only a couple of seconds off the fastest GTs at the time, while feeling that there was a lot more still to come. Being an older car the 997 is likely to struggle for ultimate pace in the dry but I think a wet race could help us. 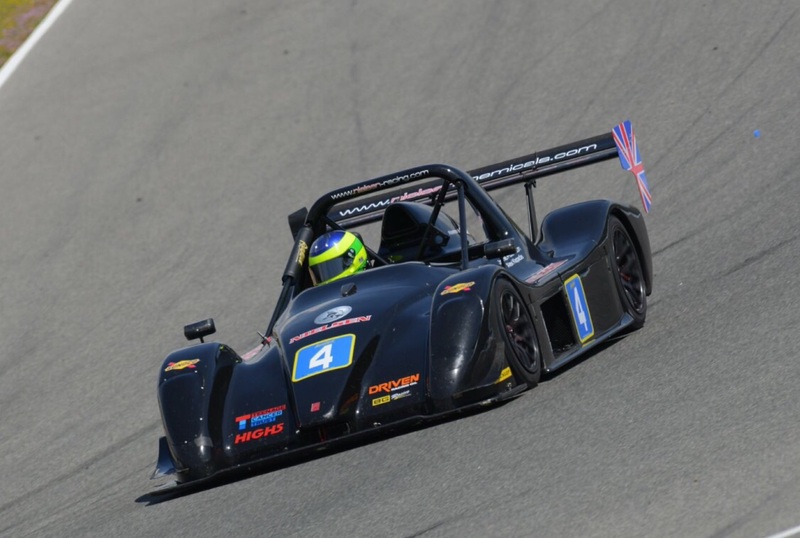 I have had a busy week since the test and with two days of driver coaching in the Radicals, trying to cram a few days in at my business and also the Radical European Masters at Silverstone this weekend. As I write this I have just this afternoon taken pole for the first race so we are hoping for two good results on Sunday before jumping in the car on Sunday afternoon and driving straight from Silverstone to Le Mans ready for our scrutineering first thing on Monday morning. 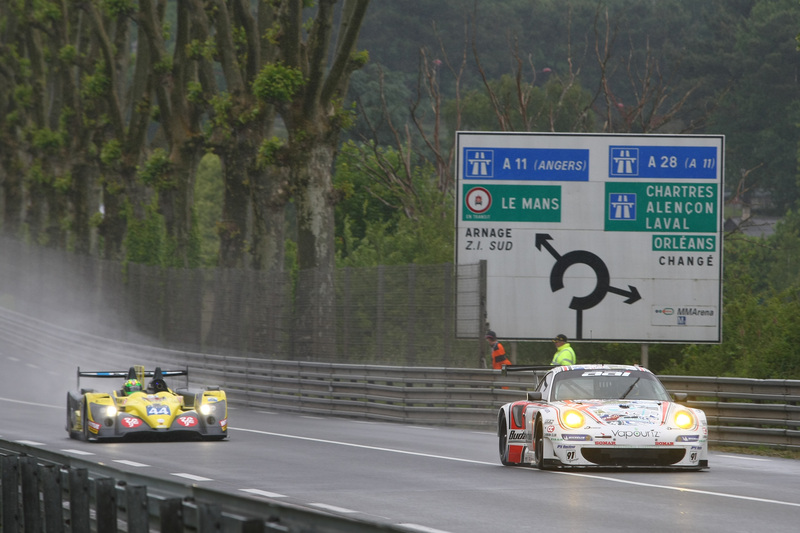 One last thing; a bit of personal advice to anyone who is driving to Le Mans… DO NOT SPEED. You WILL get caught. A few years ago I was banned from driving on the way down to Le Mans and just a few weeks ago I got caught on the way back from a race in Dijon. The Gendarme will line the roads between Calais and Le Mans literally camouflaging themselves in the long grass around the bridges, looking out for crazy Brits who think they are immune from penalties in France. Trust me after a very big fine, a number of hours in the police station, the threat of confiscating my car and a court hearing (in France) I will not make the same mistake again. The Thursday and Friday of Le Mans week are peak hunting season for them. Take it easy.